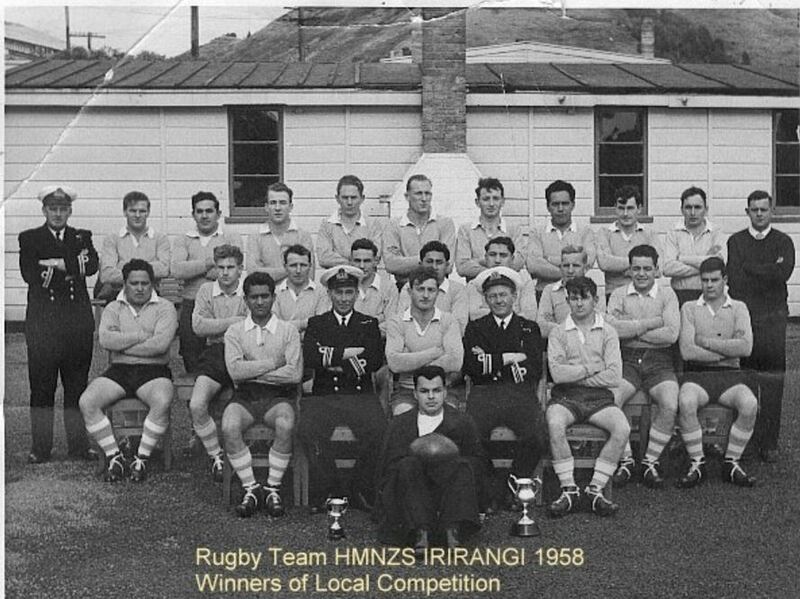 Here is an image of the 1958 IRIRANGI Ships Rugby Team. Can we name any of them? Standing: L-R Lt Stan Keeley. Joe Sullivan (sparker), Mick Pryor, ? Alan Birtwhistle, Snow Waller ? ? ? Graeme Matheson ? Front ; Sonny Hau, LTCDR Keyworth, Rex Lincoln, Frank Rolton (Engnr), ? 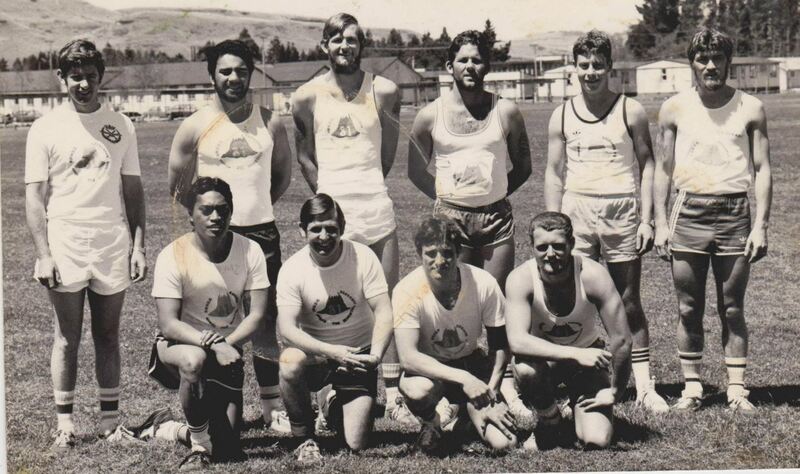 Image of the 1983 IRIRANGI Soccer Team. 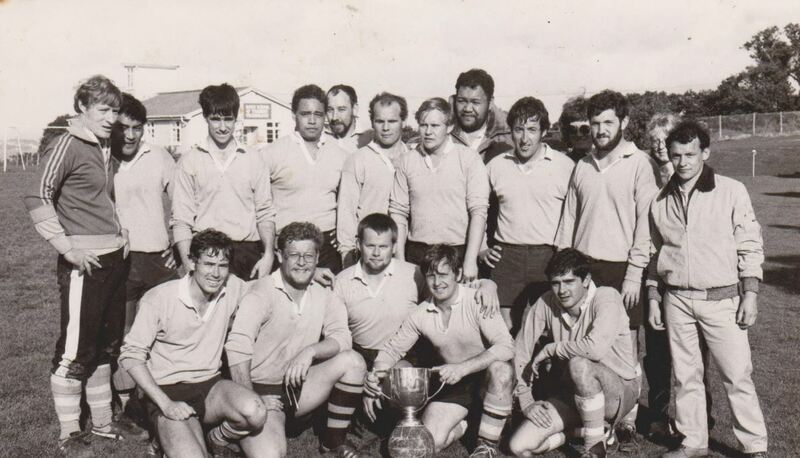 Standing – Graham Dallow, Selwyn Kaye, Malcolm Motion, Ritchie Marsh, George Harridon, ?, Lee Retelick, Steve Daley, Dave Tatana, Murray Kingham. ?. Kips Roberts, ?, ? Kneeling – Wayne Mackey, Dave Tonkin, ?, Bungy Williams, ? Kneeling L – R Frank Maika, Bungy Williams, ?, Matt Fogden. Back Row: Ray Jensen, Colin Mitchell, Kevin Gardner, Murray Auldridge, Stack Stephens, Dave Cohen, Bill Welch. Middle Row: Phil Monk, Owen Worth, George Randall, Martin Frost, Alistair Blair, Gary Johnson Coach. Front Row: Bob Ohlson, VInce Pakinga, Sid Slight, Alistair Smith, Steve Wratt, Allan Foy. 1983 soccer team – Dave Tonkin is kneeling in the middle, front row. Not standing in back row. 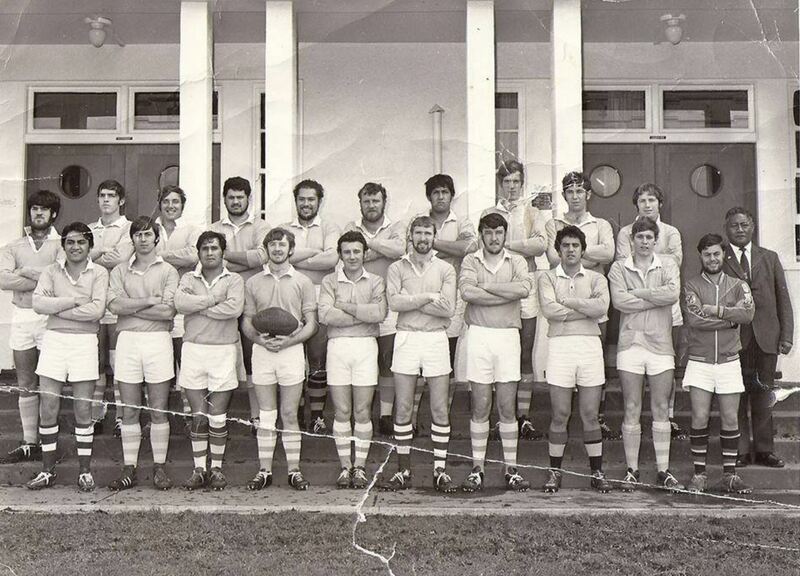 1975 black and white pic 1975 rugby team. Back row – Left to right Stack Stevens, Phil Monk, Sid Slight, ?, Ray Jensen, Bob Ohlson, ?, ?, Dave Cohen, Ali Blair. Front Row- 5th from the right is Bill Walsh. Next to him is another sparker whose name escapes me – nickname was Hong. The guy in front of Mick Kereti is Foy (Wtr). Lt. at rear could be Stan Keeley (RIP) .That could be Frank (Mac) Elliott second left middle row but I stand corrected. It’s amazing that only two years out of pussers and I don’t recognise anyone else . Just a guess but how about middle row left Laurie Leef and 2nd from right Bonga Crengle? The 1958 Rugby Team ……I wouldn’t take money on it….but the Lt standng is Stan Keeley…..
Ok the 1975 Irirangi team in black and white…. Back row: Stack Stephens, Phil Monk, Sid Slight, Albie Taylor, Ray Jensen, Bob Ohlson, Kevin Gardner, Colin Mitchell, Dave Cohen, Ali Blair – Mick Keriti – Manager. And the coloured pic of the same team …. Its fantastic that some people are able to identify faces in the photos above. The team photo on the canteen steps in Philomel was taken prior to us beating Canterbury in the Intership 15-Aside final. Fantastic photo of 1958 rugby team Irirangi. That sure looks like Stan Keeley RIP top left, what a great guy unassuming and down to earth, he would breeze in and breeze out! Behind lt.Cdr Davies I think is Charlie Brown and on his right Sonny Smith RIP, who was killed in a car that flipped going on watch to NR2. 3rd in from left middle row i think is Des Conaglen(not sure of spelling) RIP. I recognize the guy on Des’s right but can’t remember his name. And yes looks like Bonga Crengle 2nd from right middle row. There would be others there i’m sure I would know as I was drafted there around 57 and left in 59 for Pukaki and a far east trip, but time and tide have erased the old memory! I used to live in Waiouru next to Ron Pocock on one side and and a tiffy who I can’t remember the name of now on the other side. They were good years, cold in the winter with lots of snow, shame it’s all gone. I like your comments Mike Catlow. Hi Mike doesn’t time fly. I was on the 1959 Pukaki commission as an J/Tel. If my memory serves me right it was yourself, Charlie Brown, TeOne Wesley,Sonny Hau, Rock Graham with Don Campbell in charge or are there any more i have forgotten? Oops sorry for misinformation I had forgotten I rose to the dizzy heights of being an OD on Pukaki. I could have the wrong Campbell so will have to check. TeOne I have met at the odd reunion over the years, he was driving taxis in Auckland was the last I heard. Am not sure if he keeps a check on the Comms website but lets hope he pops up with some news at some stage. TeOne was at Tamaki ready to move out when I arrived there as a boy, but he was and is a hell of a nice guy I agree. I am looking forward to the next Comms reunion in Taupo 2018, where I like to catch up with old mates while they are still around. “old times”…he has had bit of a Health Knock Back but was slowly coming right. Thanks for your replies Mike and Jim. And thanks for the info on TeOne, it would be good to catch up again if I make it up there sometime. Like you said Mike while we are all still around. All the best, cheers! 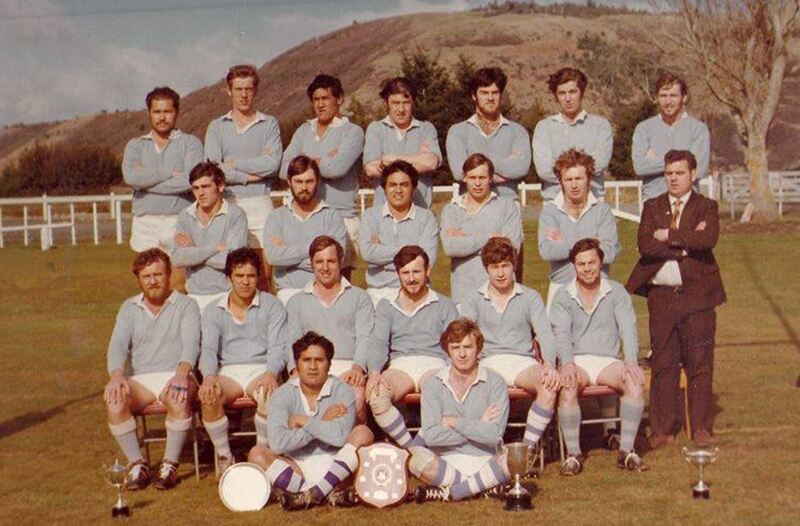 Dave Kutia from the 1958 Irirangi Rugby team passed away yesterday. A grandson graduated as an od electronic technician at Philly today. He won the Buck Shelford trophy for PT excellence. The 4th from left in back row A/B Bill Thompson. 1958 Rugby Team photo. Left Irirangi in 1959 for Pukaki far east trip.